Just a quick note to remind everyone that today is the FINAL dayt for the Early Bird pricing on both Customer and Demonstrator tickets for our Spring Stampin' Palooza event on June 18th! Whether you've never tried it before or if you're a die-hard scrapper, be sure to give scrapbooking a try with our National Scrapbooking Month promotion! 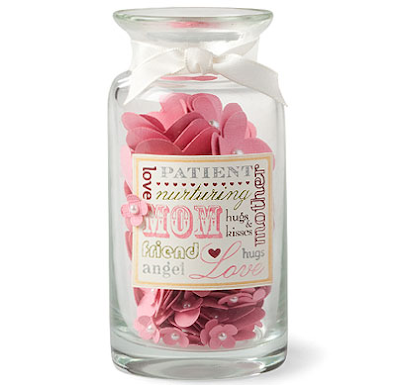 Occasions Mini Catalogue period ends Saturday! How did April come to be almost over with anyhow? Here's a wee reminder that the sales period for the Occasions mini catalogue ENDS this month on Saturday the 30th. If there's anything special inside that you know you can't live or craft without, then you definitely want to contact me ASAP to place that final order. I'll also be placing a studio-pick up order for those of you in the GTA area who only want to pay the 10% shipping charge rather than have it shipped directly for more money -- perfect if it's a small order you're placing! We've got us some winners! A few days ago, I posted a contest to encourage my blog readers to visit and join my Craftin' Caro Facebook page. The idea was that 5 lucky winners would win a fabulous tutorial. But you know what? To create good cheer and ever better karma, I'm giving it away to ALL the entrants who participated! WOOOHOOO! 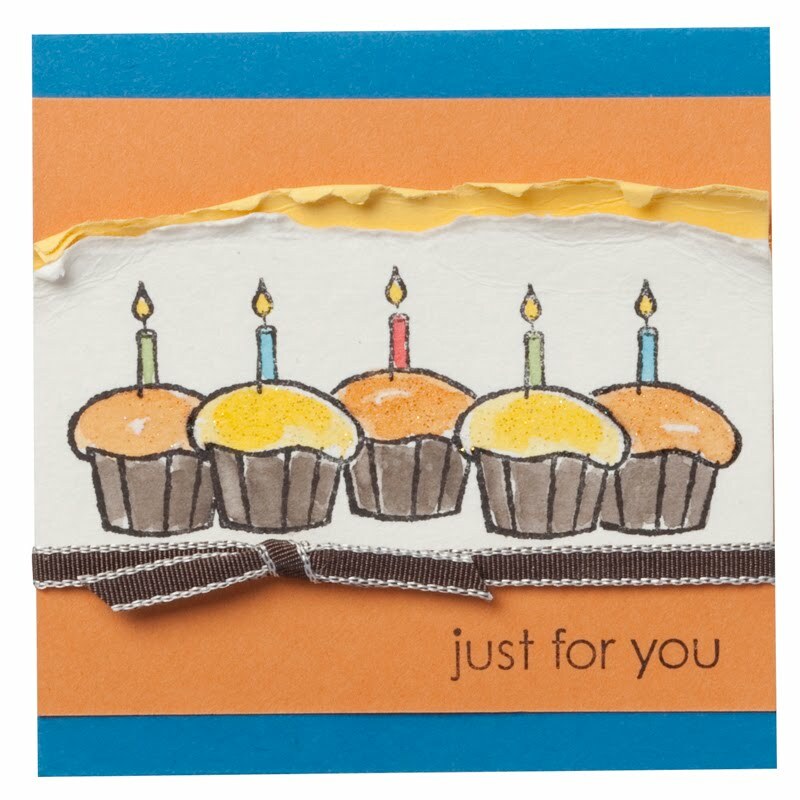 As those of you who follow my blog know, I'm celebrating 9 years as a Stampin' Up! demonstrator this month. 9 years! Not sure how that happened, but the old adage of how "time flies when you're having fun" sure rings true in this case. I was gifted with many beautiful cards from my stamping peeps this weekend, so I'll try to get them all posted here before the month is done. 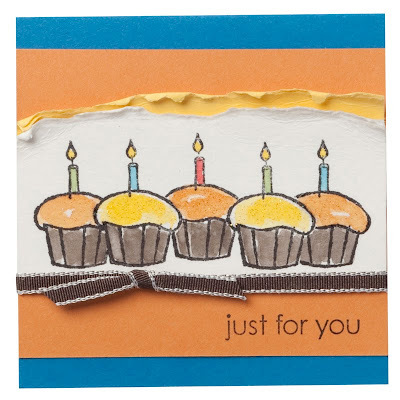 The first I get to show you will be a gorgeous card & cupcake set from the incomparable Maria Vanderform. How lucky are we to have her as part of our "Canadians, INK!" team, not to forget our gratitude at her willingness to share and teach us new things at every meeting. She rocks our socks! Here's a closeup for you to better see some of the details of this card. I just loved the two "9"s that were covered in chunky glitter - me and my bling, eh? Maria knows me well! The flowers and butterfly were all embossed with White EP and cut out before being layered on the card. 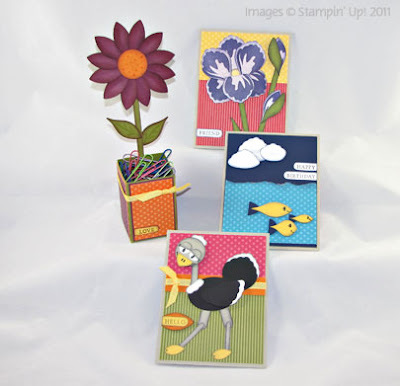 And if you do not recognize the stamp set or Designer paper, don't worry -- that's because it's using NEW goodies being featured in the upcoming Summer Mini catalogue! As a demonstrator, Maria and others have been able to get their stamping mitts on the goodies from the new catty ahead of time...always one of the funner perks of demo-hood! If you happened to miss Part 1, you can find it on the blog HERE. First off, I'll do a quick shout out to Lindsay and her awesome cupcakes, all done up in Easter colours. Yum Yum Yum! Beverly and her Easter Bunny ears showed us a really cool trick on how to cover Easter Eggs with stamped images. 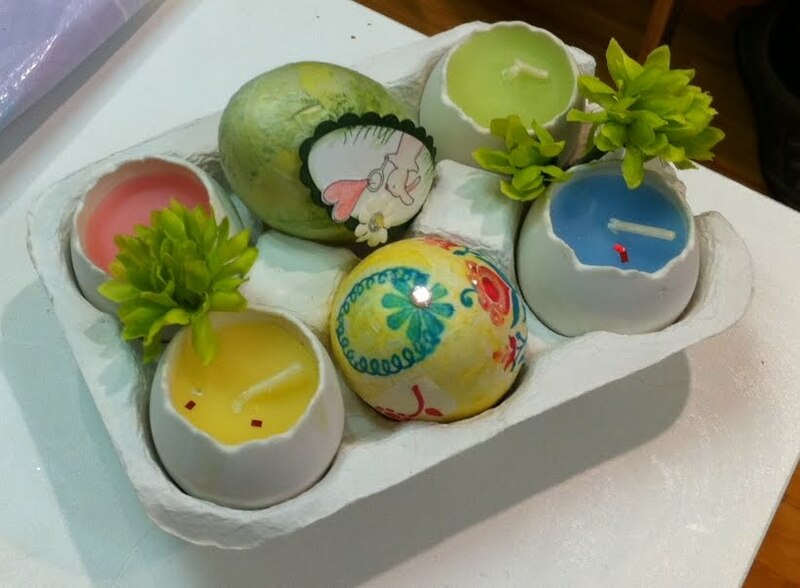 As I'm sure you can imagine, stamping on an egg and its oddly curved shape could prove to be excessively hard, so Beverly's method involved covering the egg with Mod Podge and then smoothing on a stamped piece of tissue paper. Sounds a bit like what we do with candles & tissue, doesn't it? In this case, she inked up the large flourish image from the Razzle Dazzle stamp set with the brush end of our markers and then stamped it on the white tissue paper. The eggs looked awesome, as did some of the other cool ideas she had for incorporating our Stampin' supplies with ovoids for holiday spring fun. More pictures and demos to come soon! 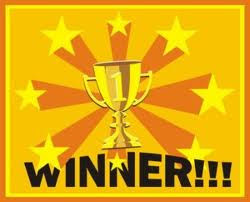 April contest for Craftin' Caro Facebook page! Have you visited my Craftin' Caro Facebook page before? 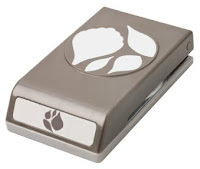 You'll find that it's an easy way to stay on top of all the Stampin' Up! specials, events I have happening, artwork shared on this page and more. Let me know what is your favourite Stampin' Up! stamp set of all time below in the Comments section of my Facebook page, and be entered into a draw for a fabulous new "Blossoms Petals Punch" tutorial! 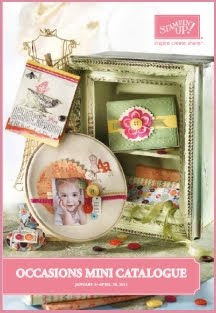 You will have a blast creating these bright and whimsical projects featuring the Build a Blossom stamp set and coordinating Blossom Petals Extra-Large punch. 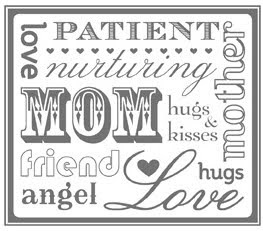 With the wide variety of colors and phrases offered in the Patterns Designer Series Paper Stack and the Fundamental Phrases stamp set, you will have plenty of choices to customize these projects for any occasion. Delight in the fun and nearly endless possibilities for creating projects with the Blossom Petals punch in traditional and not-so-traditional ways! 5 lucky winners will get this amazing 25 page document, full of colour photos and instructions on how to create these wonderful cards. Contest ends Wednesday April 27 at midnight so don't delay, visit the page right away! We enjoyed another one of our fabulous team gatherings on Saturday - what a blast. With the kids having taken possession of my camera to take photos of the sweetie-pie puppy we're dogsitting this weekend, I had to resort to using Christyne's iPhone for the night. I'll start us off with some of the great cards my downline gals made and brought in to share. I think that they love that I give them extra door prize tickets when they do and *I* love how stinking talented they all are! I will be sure to take some close-ups of many of these later on this week (when I get my Canon back - ahem, Serena) to share on the blog. There are some absolute charmers in there! I also loved the mini cards that she made using left-over felt flowers and leaves, that she keeps in a metal case to carry around. Her contact information is printed inside each card, so she can hand them out as "thank yous" whenever she needs them! I wish I had taken a photo of the front of the tin case as well, as she'd stamped on it using Stazon and coloured it with craft ink. Anyone manage to grab a photo? Anyhow, we're off to take little Miss Fluffy Head to the park for some family play time, so I'll return on Monday with more shots from the gathering, including other demos and the Make & Takes everyone made. Enjoy your weekend! There are 2 fun events happening this weekend...which will YOU choose to attend? Saturday DAYTIME is my monthly "Coffee and a Card" drop-in day at the studio. It's fun, it's free, and you're welcome to pop on in to say hi, stamp a quick card and visit for a while. This month we'll be making a card using the new Build A Blossom stamp set and matching punch, both from the Occasions Mini Catalogue that expire at the end of April. With spring (hopefully) just around the corner, and the celebrations of Easter & Passover upon us, it's a chance to get in the spirit of new beginnings and fresh, fresh colours! 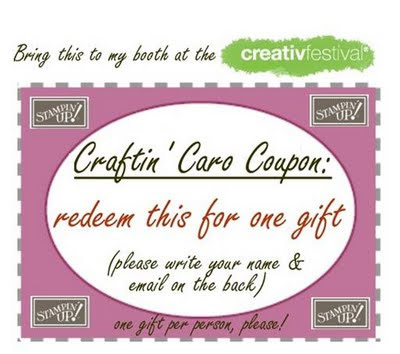 If you got a chance to visit my booth at last week's CreativFestival and met me for the first time, this is a great opportunity for you to learn more about Stampin' Up!, our great paper crafting products and the services I provide. Drop-in hours are between 10am and 4pm... I hope you can make it! Saturday EVENING brings my monthly team gathering, where demonstrators come out together to play. for a few hours. Not a demonstrator? That's okay! You can always attend one of our meetings to see what it's all about - no pressure, and you get in FREE is a first-time guest. Be sure to RSVP if you would like to come to either of these events! 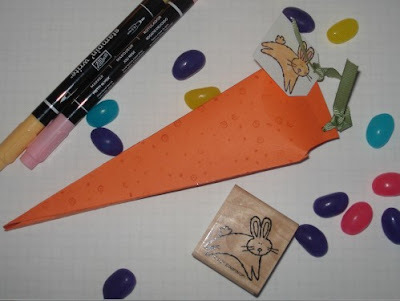 So with nothing new to share and with Easter coming up, I thought it would be fun to show you a project I did 4 years ago with my Stampers Club gals: a little stamped carrot gift box that was appropriate to the season. It uses a template I found on the demonstrator Stampin' Up! website (we have a giant pattern gallery to help us make cool projects) to make a simple 4-sided carrot box out of cardstock. 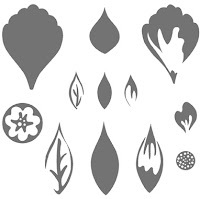 Click here for a pdf version of the carrot box template. ENJOY! Cupcakes are one of the all-time favorite birthday treats. Line up a whole host of cupcake delights complete with birthday candles on a card for the next birthday boy or girl in your family. It’s a sure-fire way to put everyone in the mood for the sweetest part of the birthday festivities! A free gift for my blog readers! I always love when my blog readers come by to say "hi" when I'm at the Creativ Festival. So be sure to stop by our booth (#501) to visit with me, Big Shot Brent, Christyne and all the other wonderful gals who will be helping out. Just like I do each time I'm there, I want to reward your loyalty with a little SU treat. So don't forget to print out this special blog-readers coupon... be sure to fill it out ahead of time on the back to redeem for some "blogger candy"!